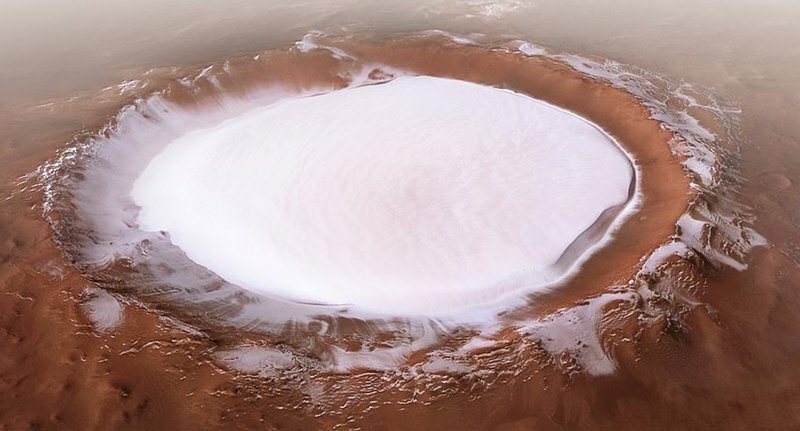 The European Space Agency (ESA) has released pictures of a massive ice-filled crater on the surface of Mars. While on earth we get dustings of snow and frozen lakes, the red planet presents wintery scenes in a considerably more mystic and alien way, with ice filling a massive crater and creeping out over its edges. The Korolev crater is a 50 mile wide feature situated in the northern lowlands of Mars, south of a large area of dune-filled terrain which circles part of the planet’s northern polar cap, also known as Olympia Undae. The crater is filled with a massive ice mound, measuring from the middle at around 1.8km thick all year round. The ice forms a glacier containing roughly 528 cubic miles of non-polar ice on Mars and is the result of a ‘cold trap’ caused by the crater’s floor being situated around 2km underneath its edge. The most profound ice-filled parts of the crater act as a natural cold trap as the air moving across the ice sinks, making a layer of cold air sitting directly over the ice which keeps it from warming up. The picture was shared by the ESA and is made up of five different pictures which have been collated to give an ‘oblique perspective view’ of the crater. After seeing the picture, some befuddled Twitter users had to ask for elucidation about whether the crater held water ice, which I assume is just the similar kind we have here on earth, or CO2 ice. If we ever do colonise the red planet, we should remember this place as a potential spot for year-round ice skating. Korolev could be a real moneymaker – unless I’m underestimating how cold it is and we would all freeze, obviously. In the mean time, another Twitter user shared another exclusive picture showing water on Mars.